Our company is a that produce the IPL machine and ink products. We can supply different type, different color, different capacity ink. Our base is one of the largest production base and we sell the tattoo ink many years. Our products have ISO13485 and medical CE. We also represent tattoo machine , tattoo accessoriestip power, Tattoo needle Etc. And the (IPL) machine, (RF)machine, Elight and so on. Hope to build long-term business relationship with you. IPL Power 800W (220V or 110V). Laser motherboard 250W (110V or 220V). RF power :200W (110V or 220V). Our this machine has 8 languages, as follows. Russia, France, Germany, Spain, Portuguese, Poland. It's the new generation of beauty equipment, it combines with the functions of optical energy and electromagnetic waves. It adopts elective absorption of light, which could get different impedance between target tissue and abnormal skin. It could strengthen absorption of electromagnetic of target tissue in the condition of lower light energy, which could greatly reduce painless during treatment. To remove unwanted thick or tiny hair. To make your skin tightening, lifting skin, improving flexibility and tone of skin. To rejuvenate your skin:removing deep wrinkles, pigments, freckles, vascular lesions (telangiectasis) ; whitening skin, changing large hair pores. To remove Acne : Improving the situation of oily skin; Killing acne bacilli. Technical parameters and Features: Technical Parameters. Display Press display Stand handle 1550mm(or 1230mm) with 3 filters. Treatment Probe:1pc with 7filter 480 for age spots, sun spots, pigmentation troubles. 560 for Skin rejuvenation; 640 for hair removal. (430;530;590;690 optional). Energy 1-50J/cm2(IPL) 1-50J/cm2(RF) Shot period(Frequency) 1-5 second adjustable Lamp longevity 150,000shots. (OR 12×30mm² optional) Cooling system Wind+water+semiconductor Voltage AC 110V/220V, 60Hz/50Hz. E-light owns all advantages of traditional IPL treatment. No risk of burning and uncomfortable feeling cause by IPL treatment. Good result for blond hair and light-colored soft hair. Modular Design of inner structure, easy to repair; 3. Foot touch supplied, to meet your personal operation habits. When the RF energy get into the skin, which could stimulate the water molecules of dermis to rub each other then make a lot of heat, when the temperature reach at 68-72 degrees, it will stimulate the dermis layer of collagen fibers immediately contract, and stimulate collagen reconstruction and reborn of long-term. Show you younger and elastic skin. Immediate result:when the temperature of hypoderm arrive at 68°C-72°C, the collagen will immediately shrink, at this time, the loose skin will lift and tighten at once. The fine wrinkles will disappear, the deep wrinkles will be lightened after one treatment. Long term effect:To stimulate the recombination and regrowth of collagen. In 2-6 months after one course treat, return you a younger and flexible skin. RF(Bipolar) output power 200W Energy 0-50J/cm2 (adjustable). Skin care after treatment 1. Use some sunscreen lotion in case of sunburn 2. Pay attention to moisturizing skin very often. Do not make a lot of face expression in 3 hours after treatment 4. Do not never go to hot place, like Sauna, spa. Eliminate spots, remove tattoos: The specific laser wavelength will effect on and melanin of epidermis and dermis. The pigments will begin to swell and explode to tiny particles after absorbed this high energy laser. One part of them will be shot out of the body, the other parts will be gradually removed by metabolism. Tighten skin, contract big pores: Spread specific fine carbon on face, after absolutely infiltrated in pores, then to shoot, it's easily burst the carbon particles to break out the spots and cutin of epidermis. The heat will stimulate regrowth of collagen, to tighten skin and shrink pores. To contract large pores, whiten skin, lighten spots & pigmentation; 3. To wipe out tattoos, to eliminate eyebrow cleaning, eyeline cleaning, age spots, birthmark. 532nm probe for color tattoo and pigmentations and have a higher energy 1064nm probe for black tattoo and pigmentations. Laser type Q-switched ND:YAG laser Laser wavelength 532mn, 1064mn Frequency 1-6Hz Cooling system Wind cooling+Water cooling+Semiconductor Light source 220V/110V 50Hz/60Hz. Moderate treatment, no risk of scars and wound. 201 4 year order machine. 3IN1 IPL Power:2000 W. Elight+ L aser power:800W. 3IN1 IPL Power:400 W. 1 Our all machines have water cooling switch. If you think the water. Temperature is high, you can press it as summer. Or you can adjust it as winter. 2 Other color for your choice. (White+Black)(White+Golden)(White+Silver)(Milk White + Silver-Grey). 3 The structure inside of this machine is upgraded. 4 Packing with foam and aluminum case. Double packing protects machine from crack. Cartoon appearance showed the new style. 8 Add Super Hair Removal F unction. SHR stands for Super Hair Removal, a new technology for hair removal which is a huge success. The system combines laser technology and the benefits of pulsating light methods to achieve painless results. Even hairs which until now have been difficult to remove can now be treated. In MOTION represents a break through in hair removal with light technology. The treatment is more pleasant than with conventional systems and the skin is better protected. IN MOTION Technology Ensures Comfort. In Motion is a new type of IPL System with a much faster speed in procedure, patient comfort and repeatable clinical results. It provides a slow gradual thermal rise to the target therapeutic temperature without the risk of injury and with much less pain for the patient. You can also set the working time : from 100ms - 999ms. We are committed to resolve all issues in a friendly and satisfactory manner. BRelated to the special items, like tattoo ink, we can not accept the bad feedback. Because the liquid has its character, and the Express-- China post Air maybe has some accident. We will give you a satisfactory reply and help you to solve these issues. 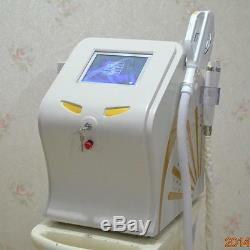 The item "3IN1 (M600+) IPL + YAG Laser + RF hair removal tatoo removal Beauty Machine" is in sale since Tuesday, November 04, 2014. This item is in the category "Health & Beauty\Shaving & Hair Removal\Laser Hair Removal & IPL". The seller is "crgwuweif" and is located in , . This item can be shipped worldwide.